If you find yourself in North Wales on holiday this is a lovely attraction to visit. We have been numerous times. I like it because it’s a reasonably priced day out! Some attractions you feel like you need to take out a second mortgage just to afford the entrance price but fortunately that’s not the case with Greenwood Forest Park. There is one rollercoaster but it’s a bit of a novelty as its run on “people power” – basically the weight of the next group of people to ride power The Green Dragon. The latest addition to the park Solar Splash is quite exciting (although I still hold the bags!) 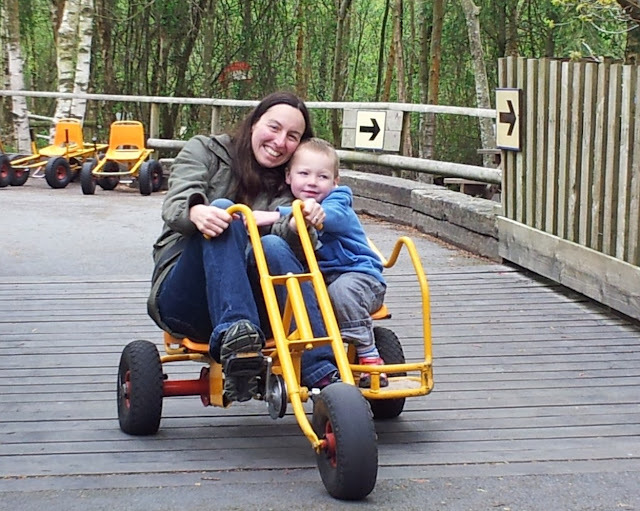 – it’s a bit of a walk too, up lots of steps, however my wife and boys found it worth the exercise and went on it multiple times. It’s most appropriate as a fair weather attraction I guess as it’s mainly outdoors, although you do have the Enchanted WoodBarn for the younger children to enjoy. Our eldest son is starting to outgrow this now. In 2016 TripAdvisor travellers choice ranked Greenwood Forest Park 8th in the top 10 theme parks in the UK, above LEGOLAND. Both have their merits, they are just very different days out. Greenwood Forest Park can be quite relaxed with not much queuing. It’s also located in a beautiful spot, its not too built up and there are lots of trees and woodland paths to admire. Children will get lots of fresh air in Greenwood Forest Park and your pretty much guaranteed they will sleep well afterwards! Youngest was a little cutie of three when we first visited and the boys still both like it now they are seven and nine. 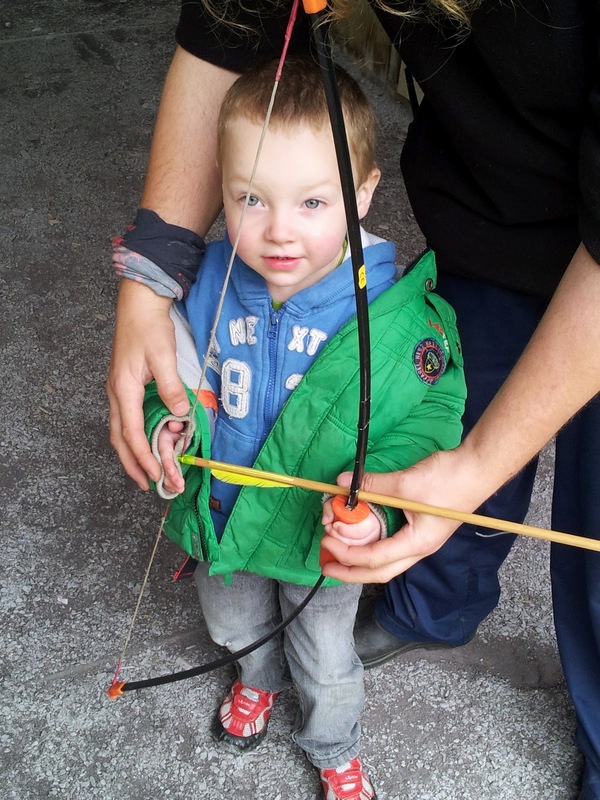 Even at three he had a go at the archery. To be honest there is plenty to keep a wide age range of children occupied. 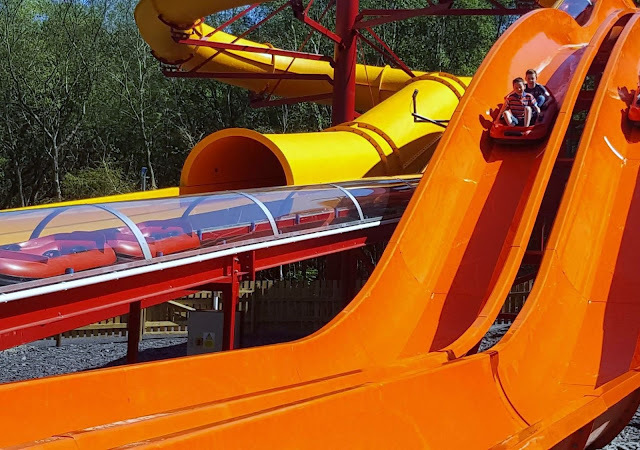 Treetop Towers is the parents nemesis - that is if you go on to keep an eye on your children prepare to bump your head and go down lots of slides!!! In the school holidays they usually lay on additional entertainment with a talented magician or pirate – both were great with the children and we have been called up to take part before.